Greek yogurt blueberry muffins are a nice treat to enjoy with some tea or coffee, especially with the colder weather. I often get asked about baked goods and sweet treats. Living a healthy and balanced life does include some treats, it should not be an all or nothing type of situation. I believe in fuelling our body and mind with nutritious food, however, I also believe in the occasional treat. What I love about the Greek yogurt blueberry muffin recipe I am sharing with you, is the fact that it is a treat but it is also nutritious. Yes, you heard me. A nutritious muffin? We always hear that muffins are dense and filled with refined carbohydrates. They are also too sweet and provide no nutritional benefit. This recipe is definitely the exception. There are many different ways to alter a recipe to make it healthy. You have to look at each ingredient and determine if there is a healthy alternative. Substitutions can be made for the sugar, fat source and flour. However, there are healthy alterations made. In this particular recipe, I did not use a sugar substitute such as maple syrup, instead I decreased the total amount of sugar in the recipe. In terms of a fat substitute, I used Greek yogurt which I have used in previous recipes such as my Greek yogurt blueberry scone recipe . It is hard to believe for most people, but plain Greek yogurt is a great alternative to butter and provides you with a fluffy and delicious end product! In terms of the flour, I have provided four wheat flour alternatives that you may consider the next time you are in the kitchen. The type if flour you use in a recipe can make a big difference in the nutritional content of the overall product. For example, using whole wheat flour as opposed to white flour will provide additional nutrients including fibre, B vitamins, vitamin E, magnesium, zinc, and folic acid. This is because when the full wheat berry is being processed for white flour, the outer layer (bran) and the innermost area (germ) are removed and the starchy component (endosperm) in between remains. With whole wheat flour, all three components are kept intact. When possible, try to substitute for whole wheat flour either in part or fully. Then, there is the other question of whether or not to use wheat flour or an alternative. There is nothing wrong with using a whole wheat flour, however, for the purpose of allergies, intolerances, other medical conditions, or just personal preference I will discuss some alternatives. Whole grain oat flour is a great alternative or addition to any recipe. I personally like to grind my own oats to make flour in my food processor. It is very easy to do and takes only a couple of minutes! Oats are a good source of fibre and are known for benefiting heart health. Compared to the other flour alternatives the taste is fairy neutral and the consistency is very similar to wheat flour. Chickpea flour may also be called besan or gram flour. This is a healthy gluten free and vegan flour that is rich in its nutrition/health benefits including managing cholesterol and control blood sugars. Chickpea flour contains a good source of protein, fibre as well is a source of iron, vitamin B6 and thiamin. This flour is a source of fibre and complete protein. It is a good gluten-free alternative to use in baked goods such as cookies. Initially, you may want to incorporate small amounts of this four to get a feel for the texture. A whole grain barley will provide you with a good source of fibre which can in part help manage blood sugar and cholesterol levels. Although barley does contain gluten, it is a great alternative to wheat flour and can be used in a variety of different recipes including pancakes, bread, muffins, and biscuits. This grain free flour contains some protein, healthy fats and vitamin E. You can use almond flour in baking as well as to substitute for bread crumbs! 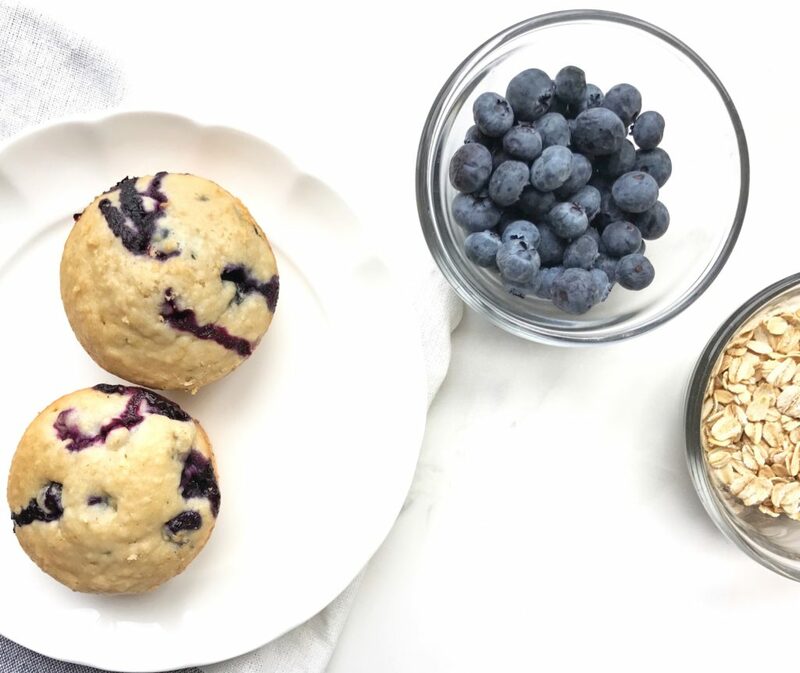 Other than making the substitutions mentioned above, you can enhance the nutritional content of a recipe such as this Greek yogurt blueberry muffin recipe by adding some simple ingredients. Any ingredient that will increase the fibre, healthy fat and/or protein content of the recipe will make it that much more nutritious. Remember to always speak to your health care provider before making any dietary changes. The Greek yogurt blueberry muffin recipe provided is a baseline recipe for someone trying to slowly incorporate healthy alternatives in their baking. So, you will not see ALL of the substitutions made fully or the additions mentioned above. Please feel free to play around with the recipe and share with us any additions or changes you make! These Greek yogurt blueberry muffins are delicious, fluffy and filled with nutrients like protein, fibre and so much more! Pre heat oven to 400°F. In a liquid 2 cup measuring cup, add the oil, egg and yogurt. Add enough milk (or water) to the measuring cup until it reaches the 1 cup mark (approximately ⅓-1/2 cup). Then, add in the vanilla and whisk together. Mix the wet ingredients to the dry. Add lemon zest and fold in blueberries. Bake for approximately 15-20 minutes.